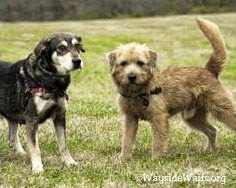 Dipper and Parker are a bonded pair of senior dogs that were rescued from a hoarding situation. They were kept outside without human contact so did not receive socialization. They were each adopted from Wayside Waifs animal shelter - separately. Both ran away from their new homes and ended up back at the shelter where staff realized this pair really needed to go to a home together. Dipper is a 8 1/2 year old German Shepherd mix. 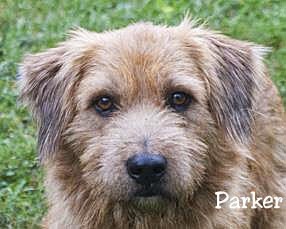 Parker is a 6 1/2 year old male Terrier mix. They're an adorable, sweet pair! Hi! 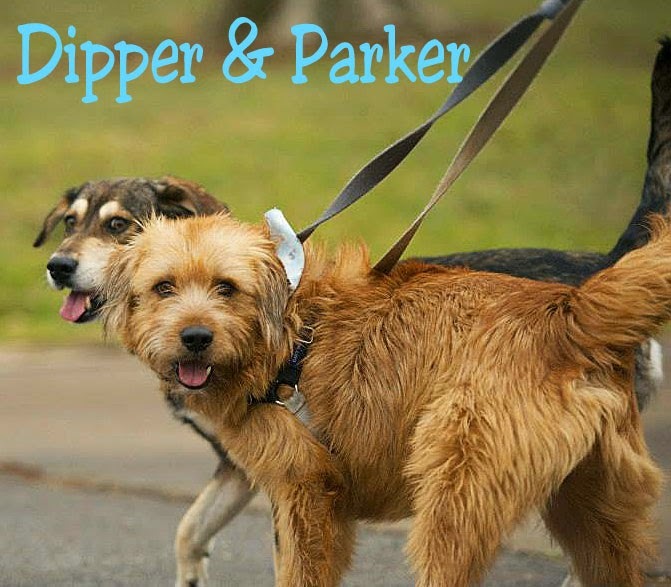 We are Dipper and Parker. We don't want to bother you or take up much of your time, but we are looking for a home and we hope you might be just the person who is looking for us too. We are sweet and cuddly and very shy, until we get to know you. We are looking for kind, patient, and gentle people who will welcome both of us into their home and life. We know we're asking a lot from you and we know we're not the dogs for just anyone. But someone out there must need two sweet souls to brighten up their life, right? We have hope and faith that we can find the family who will love us for who we are and who will give us the life we deserved all along. 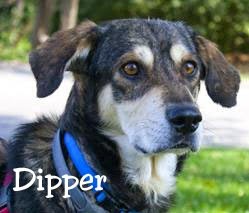 I, Dipper, am a handsome and distinguished, 9 year old, 47 pound, Shepherd mix. My best buddy is named Parker and he is an adorable and cuddly, 6 year old, Terrier mix. We are best friends. We lived together in an awful place with a dog hoarder. There were so many of us dogs there, neglected and lonely, just trying our best to survive. We didn't have the basics in life that so many dogs take for granted. We were kept outside without human contact. It was both exhilarating and terrifying the day we were rescued and brought to Wayside. Oh my, it's hard to describe the feelings we had. I spent my time trembling in fear at the thought of strangers coming near me. Parker and I were split up at that time, and I couldn't stop wondering how he was doing. It was only a few months ago, but it feels like a lifetime. It's been such a whirlwind since the day we first got to Wayside. Since we were both shy and never socialized with people before, we spent awhile just getting acclimated to the human touch, walking on a leash, learning about dog beds and treats and couches...that sort of thing. At one point, we were both adopted, on the very same day, to different people. But as nice as our new families were, things just didn't work out for us there. We both ran away from our new homes and ended up back at Wayside. I've never been so happy to see anyone in my whole life as when Parker walked into my kennel! We comforted each other and joyfully played. It was a beautiful sight! And the Wayside staff realized that what we really needed was to go to a home together. We are more confident as a team. And we comfort each other through all the craziness of life. We were meant to be together and we can't wait to share our loyalty and devotion with you, too! We hope you will be patient with us and give us plenty of time to adapt to our new home and life with you. It will take us longer than most dogs to feel comfortable and learn to relax with you and trust you. We will get there, but it will take time. We'll do best in a home with just a few people who we can deeply bond with and a home without a lot of activity going on. We love to be by your side and hope you'll be home a lot with us. We will thrive with a calm and positive energy around us. Please offer us positive reinforcement and let us know when we do good, by offering us gentle praise and tasty treats. We have never had anyone take the time to train us, but it's not too late! We are a couple of smart cookies and we love to learn! It makes us feel special when people care enough about us to teach us new things. The Wayside staff will be happy to give you plenty of ideas to help us thrive in our new home. We hope you will give us lots of time to learn to trust you, understanding that everything is new and scary. Introduce us to new things a little at a time, and please keep in mind that we are trying our very best to fit in. Calm, quiet, and patient is how we hope you will be with us. We will do best in a home without kids under the age of 5, since their quick movements and loud voices are scary to us. And we both need to be closely supervised whenever we are outside. At this point, we are likely to run from you out of fear if we get loose. And Parker can climb a fence, so we will need to be on leash with you at all times when we are outdoors, at least for now. We don't want to scare you away from us, but we want to be sure you're the right person for us. We want to know up front that you are that special person who understands our quirks and challenges, but that you will love us anyway, because you want to make a difference in the lives of two sweet dogs who have never been given a break in life. 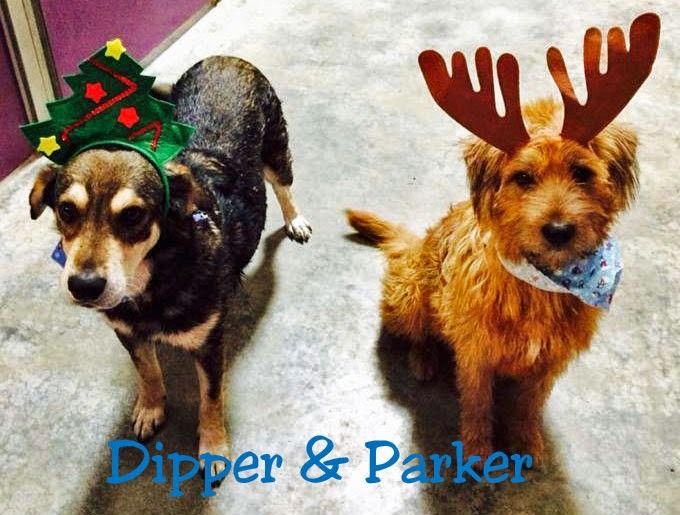 Dipper and Parker were hoping Santa would bring them a forever home. We know you're out there! You've been looking for us, but the timing just hasn't been right. And we've been looking for you, too. We've been waiting and figuring things out. Parker and I are finally together, ready for our new life to begin. And what a beautiful life it will be, as part of a real family. We're ready! What a cute pair. Hope the new year finds them in a new home. I do hope someone adopts the pair they are cute and sound like they need to stay together. Dipper and Parker have such a story. 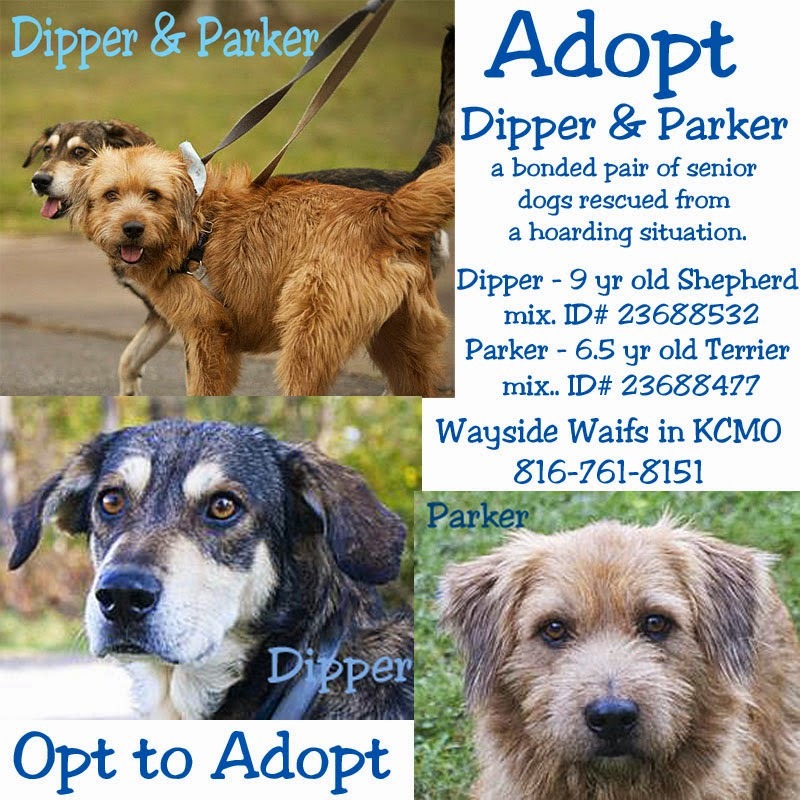 I hope that Dipper and Parker get adopted together for the New Year. What a pair of cuties! Who could resist those adorable faces? Sharing. What a very sad story they had, but the ending it yet to be written. :-) I hope these two find a very special home for the New Year. I hope they have a home very soon. Poor babies. They are so sweet. Poor babies. Sharing.